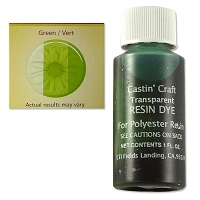 1) Mix up 5ml of resin (using 2.5ml of each half) and add two drops of green resin and continue to mix. Use your stir stick to add the mixed resin to each of the cavities in the three copper frames. Set aside for the minute. 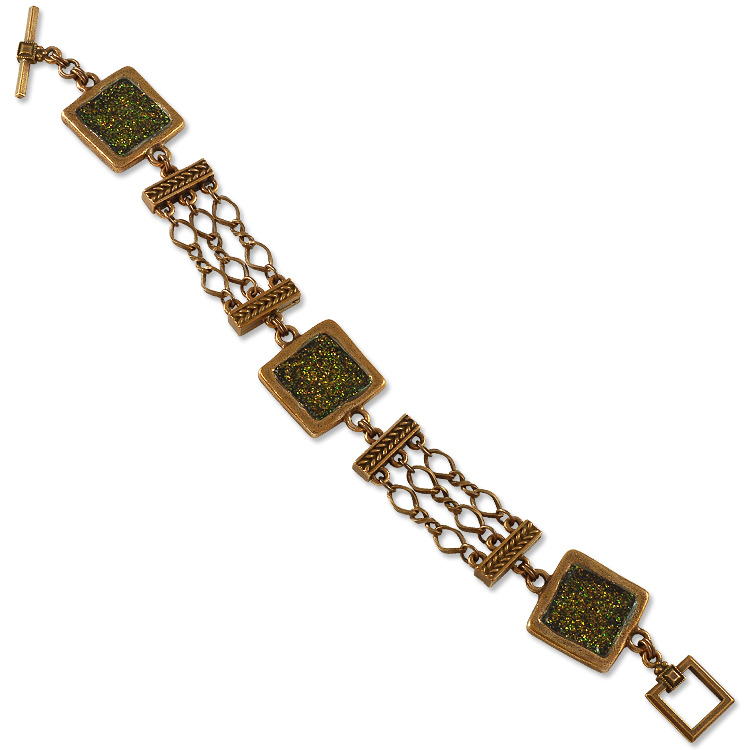 2) Take the 5-1/2" length of chain and cut six sections that are two large links with a small twisted link in-between. 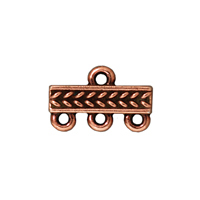 Open twelve jump rings and use each to attach the large links of the cut sections of chain to two of the braided end bars. Set aside. 3) Now, back to the resin in the frames. Wait until the resin becomes just a bit tacky and then sprinkle a bit of the green and then orange (or whatever color glitter you desire) glitter onto the surface of the resin. Some of the resin will stay on top, while the rest will sink into the resin and stay suspended at various levels. (Note, if you added the glitter straight away after pouring the resin it would all sink to the bottom) Allow the resin to dry completely for at least 24 hours before moving onto the next step. 4) Open up all but two of the remaining jump rings. Use the first two to attach the square part of the toggle clasp to the first resin frame. Use the second two to attach the first resin frame to the first end bar/chain grouping. Use the next two jump rings to attach the first end bar/chain grouping to the second resin frame. Use the next two jump rings to attach the second resin frame to the second end bar/chain grouping. Use the next two jump rings to attach the second end bar/chain grouping to the last resin frame. 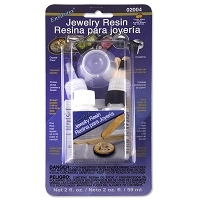 5) Take the next two open jump rings and use these to attach the last resin frame to the two jump rings that remained closed. Now, pick up the very last two open jump rings and use these to connect the bar end of the toggle clasp to the two closed jump rings that you previously attached. Done! Glitter - a combination of green and orange was used.